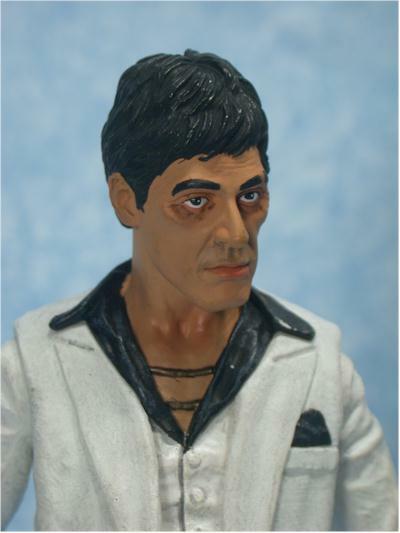 Mezco Toys picked up the license for Scarface awhile back, and hit us up first with a set of rotocast caricature style figures. Some folks were thrilled - others, like myself, were less ecstatic. I'm not a big fan of Cedar Point chalk drawings, and so three dimensional caricatures don't do much for me. Mezco has now released their 7" scaled 'realistic' figures. 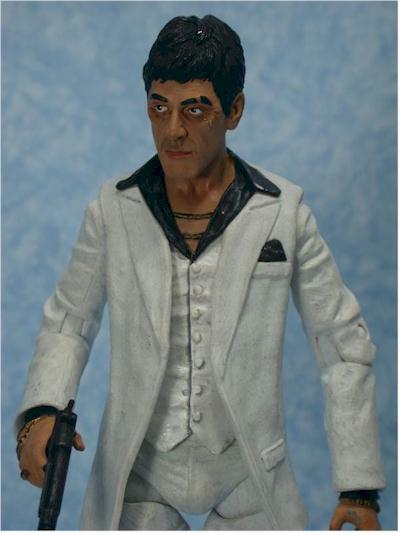 There are three in the set - Tony Montana as 'The Player' in a white suit, Tony Montana as 'The Fall' in a black suit, and a variant 'The Player' figure in a dark suit and different head sculpt. I saw all three this last weekend at my local Media Play. Of the three, I liked the head sculpt on the white suit Player the best, so that's the one I picked up. I'll mention any sculpt issues I had with the other two in the review though, to give you a rough idea of what struck me on the peg. These are running around $13 - $18 each, depending on where you pick them up. At Media Play, they were $13 each. I have some suggestions for places to pick them up at the end of the review. Mezco stuck with clamshells for these guys, and the work just great of course. The insert is a solid cardboard, rather than thin paper. It's pretty sparse though, and while that simplicity works well for the front of the card, there could be a little more in terms of text and graphics on the back. Still, it's going to hold up well to peg wear, and store fairly easily for the MOCers. It shows off the figures in the darker suits better than this one, because the white suit tends to blend in with the white insert. If I were grading this figure on head sculpt alone, it would get another half star, maybe even another full star. This is easily my favorite version of Scarface that's been out to date. This sculpt is about 90& realistic, 10% cartoon. That's okay by me, and is a big improvement over the rotocast versions. We haven't seen the final version from Sideshow yet, but until then, this is the winner. The other two in the series didn't do as much for me. The variant Player was more cartooned up than this one, and the Fall version is in an extreme moment in time, a snapshot of his craziness that didn't really translate well. Still, serious fans are likely to want all three, and going with different head sculpts (and not just different paint schemes) for the two versions of the Player was a nice touch. Unfortunately, there's also the rest of the sculpt here, which pulls down the overall score. It's a very rough sculpt, with harsh lines, lots of texture, but things look clunky and thick. The shirt collar doesn't look like a shirt, it looks like thick plastic roughly carved, the vest and buttons blend in together with little definition, and the jewelry, while it's all here, looks more like a mass market job than what we've come to expect from Mezco. The body is also more cartoony than the head. The thick legs with oversized bell bottoms, the exaggerated length of the arms, and the generally odd proportions end up making him look more like a Saturday morning cartoon than a Cuban killer. The hand sculpts are perfect for holding the two accessories, and the bracelets are sculpted hanging in a very realistic pose. 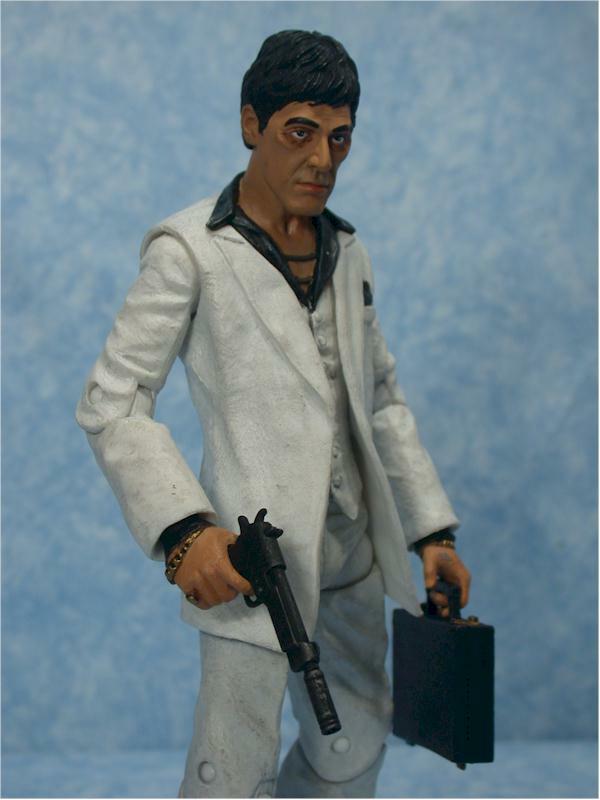 This figure is a 7" scale, and works fine with other 7" scale figures, if you overlook the fact that Al Pacino is so short that this figure really goes better with 8" figures. I can live with the sculpt issues though, but it's the paint that really disappointed me. The most obvious issue is the dirty nature of the white suit. Obviously, this wasn't a problem with either of the other two versions. Mezco likes to use a blue wash to give shadows and highlights to white surfaces, but on this figure, it ended up dirtying up the suit way too much. Tony wouldn't have been caught dead looking like this. Even if you ignore the issues with the white, you'll find plenty of general quality control problems. There's white on the black color, all the gold jewelry is bleeding into the skin, and most of the lines of definition between colors are poorly done. There are some highlights still. The face paint is still great, although you'll notice the dark wash in the close up photos. In person though, these dark areas aren't nearly as noticeable, and work to give him the worn look in the film. The hands themselves are done nicely, ignoring the jewelry. There's even the small tattoo on his left hand, in perfect detail. While the other variants didn't have the problems with the white suit, they did have the same QA issues. Tony has quite a bit of articulation, much more than I anticipated. There's the required ball jointed neck, which doesn't have quite as much mobility as you'd like to see, but it still a huge improvement over a cut neck joint. Then there's ball jointed shoulders and hips, pin elbows, ankles and knees, and get this, ball jointed wrists. Oh, and let's not forget the cut waist as well! Cut biceps would have been nice - they would have blended in pretty well, and given him a lot more arm poses - but in general, you couldn't ask for much more. Tony isn't supposed to be a super articulated ninja, and the articulation he has lets him stand perfectly on his own, and pose his arms in enough ways to make me happy. And making me happy is what it's all about, right? Tony has a grand total of two accessories, but what beauties they both are. 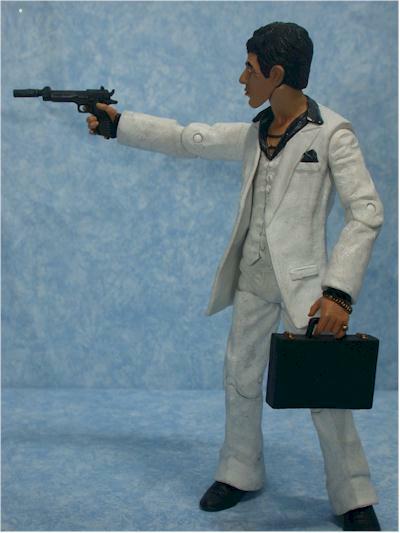 There's a very nicely sculpted, and nicely painted, briefcase that fits in his left hand. He can carry it perfectly, something that seems to be so rare these days. The scale is a squige small, but that's nothing to get worked up over. Then there's his gun, and the scale here is perfect. That's another problem these days - getting the scale right on weapons. Here the gun looks excellent in his hand, not oversized and not puny. There's a silencer as well which is removable if you're not worried about drawing attention. These are accessories you'll use with the figure, and won't just toss in a box. Kids are likely to be completely uninterested in this character, simply because he's not the most interesting visually. He's a guy in a suit. Worse, it's a corny looking suit from over 20 years ago. 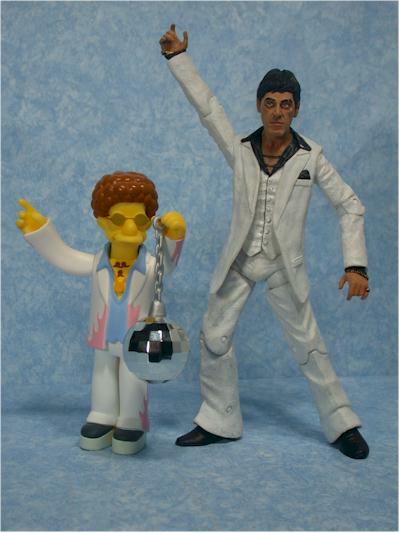 They might even mistake him for *gasp* Tony Manero. 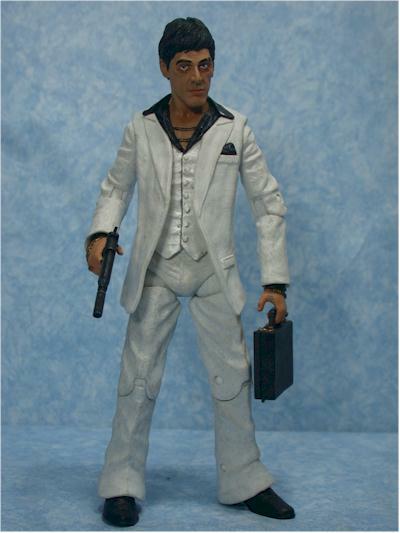 I'm assuming you pay about $13 for this figure, which is about average for a specialty market figure in this scale. Get him down around $10 like I did, and you can add another half star easy. Pay more than $14 though, and you can knock a half star off. With the paint issues, you'll want to pay special attention to each one on the peg. There were two of the variant Player figures in the case I saw, so you even had a choice there. This isn't a perfect figure by any means, but the head sculpt alone keeps him above average. Add in some nifty accessories and solid articulation, and you can overlook some of the paint problems. This is one of those rare figures that disappointed me at first, but over time I liked it more and more. - CornerStoreComics has the individuals (minus the dark suit Player) for $14 each, and the pair for $27. 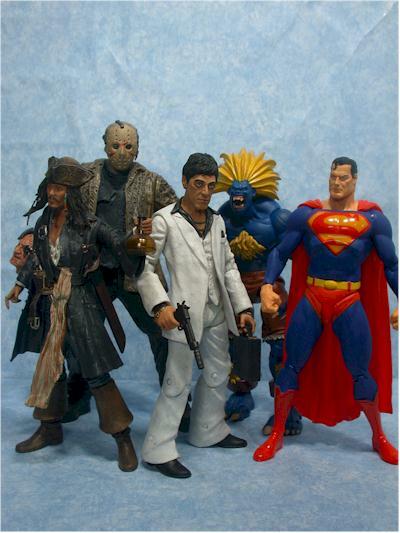 - Killer Toys has the individual figures for $18, or a set of two for $30. They didn't have the dark suit Player listed either. 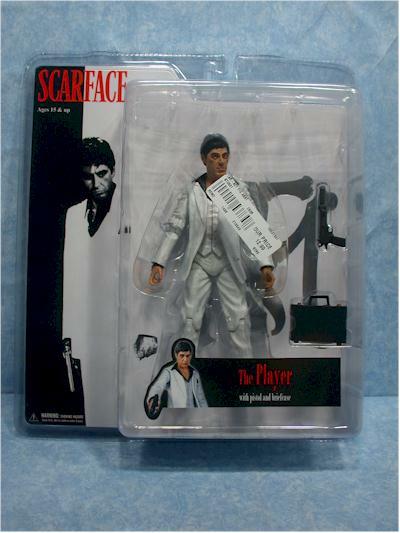 - And for the ultimate Scarface fan, there's always the 1/6 scale talking version or 1/4 scale version from Sideshow! - Mezco has their own site of course, with lots of info on all their lines and some great message boards. - and if you're looking for a great general Scarface site, with tons of wav files of his various quotes, check this one out!